The nose of the blue airplane kisses the waypoint on my flight pad’s display. “Race 53, Turn 2,” I announce, flipping the yoke to the left. Tess’s right wing snaps skyward. I pull back swiftly, keeping her nose from dropping. G-forces push me back in my seat. A gravity-fed rush of adrenaline places me in slow motion. It’s happening in milliseconds, but it feels like minutes. Calmly looking left, down along her wing, the ground below slowly spins as I pirouette around the tall, skinny storage tank that serves as the turn pylon. I’m right on target. I snap the yoke back to the right to level the wings, pushing in to nail her nose to the horizon. Time speeds up again, and I let out a whoop of pure joy. I’d forgotten how much I love this kind of flying. Of course, this isn’t for real. It’s only a simulated race. Practice. Practice for a rusty race pilot and a rusty race plane. Like out-of-shape athletes looking for a comeback, we’re back in training, Race 53 and I. 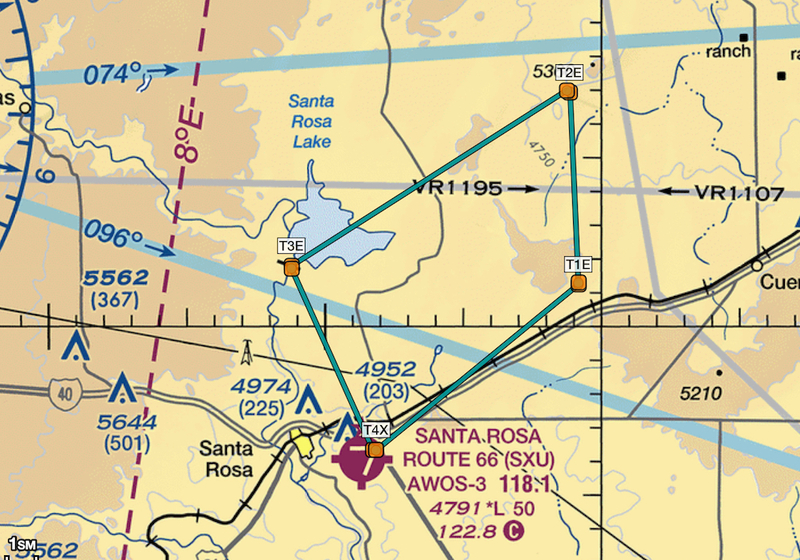 How do you train for an air race? By practicing racing techniques and racing maneuvers. What gym are we using for this practice? Our own private race course. A couple of years ago I laid out a “practice course” near our home airport of SXU to keep me sharp between races, and to test out speed mods. It’s like a mini-SARL race course, except it’s long on the turns and short on the straightaways. It’s just a hair over 33 miles in length, but with takeoff, two runs around the course, cool down, recovery and landing, it’s an hour’s flying with eight fabulous adrenaline-fueled race turns. I record each practice session on CloudAhoy, an app that uses the plane’s GPS feed to create a highly accurate record of Tessie’s ground track laid onto Google Earth satellite maps, for post-game analysis of our “workout.” The most important thing, of course is to ensure that we didn’t “bust” any of the turns. The second most important thing is that the turns are tight and that each run is close to the run before. Lastly, it makes me smile when two laps look like one on the download. That tells me that I’m flying precisely on the boring part—the straightaways—which is not my strength. And speaking of flying, Tess is flying marvelously. Better than ever before. She’s fast. Really fast. Her engine is running strong and cool. And I’m not doing half bad myself, given that I haven’t flown much at all lately, not as much in the last two years as was typical prior to all our maintenance headaches, and I haven’t really raced for nearly two years. OK, well, it’s actually one year, nine months, nineteen days, seven hours, fifty-three minutes, and forty-two seconds. The nose of the blue airplane kisses the waypoint on my flight pad’s display. “Race 53, Turn 3,” I announce, flipping the yoke to the left. Tess’s right wing snaps skyward. I pull back swiftly, keeping her nose from dropping. G-forces push me back in my seat. Yeah, I’d forgotten how much I love this kind of flying. As I drove down Airport Road the distinctive howl of a twelve-cylinder Merlin filled my ears. It came from the left, shot overhead, and disappeared to my right like a cannon shot. I ducked and slammed on the brakes, screeching to a halt. Holy crap! I’ve been buzzed by a Mustang! Then two more in close succession: Vaaaavooooom!!! Vaaaavooooom!!! I looked to the right. To the left. Then I leaned forward on my steering wheel and looked up. The sky was empty. 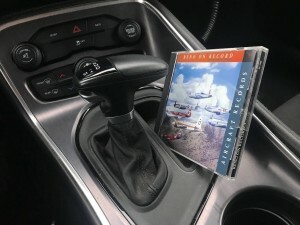 Next, the growl of a heavy metal radial buzzed by, shaking the car, and I remembered: I had left the car stereo on full blast when I left the hangar, but the CD was between tracks so I’d forgotten I had it on. It was Reno on Record 3blaring out of my Alpine Speakers, not real airplanes tearing up the sky. Sheepishly, I turned down the stereo, tapped the accelerator, headed on down the road again, glad that I was alone and no one had seen me ducking phantom planes. Well, not phantom. The planes are real enough. They just aren’t here. Not now. Their growls, whines, and roars were captured in high fidelity recordings as they passed Pylon One during the National Air Races in Reno in 1990, 1991, and 1992 and put on CD by AirCraft Records. Who on earth would want an hour’s worth of nothing but engine sounds? Well, as it turns out, people like me! Although I didn’t know that until I bought a copy. I discovered this wonderful CD quite by accident, and I’m sure glad I did. I was actually looking for whiskey when it happened. Well, more correctly a whiskey decanter. Back in the ‘70s the McCormick whiskey folks made several commemorative decanters that were sold at the National Air Races. One, which I scored on eBay, looks like a race pylon. A second one looks like a radial engine with a three-bladed prop. I’d seen pictures of it, but I was having a hard time finding one for sale. Of course, I had a saved search to alert me if one was listed, but over the years I’ve found that sometimes the best successes, when it comes to buying collectables, happen when you come across something that’s not listed quite the way everyone expects—so if I’m bored, I’ll just do some random surfing with very broad search terms, flipping through a few pages to see what I see. Thus it was that I stumbled upon Reno on Record, the record. 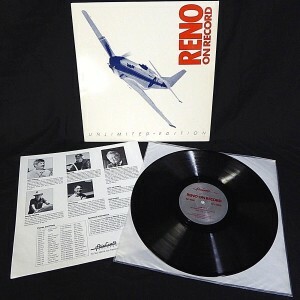 No kidding, I found an old-fashioned vinyl LP record, called Reno on Record. It was from 1986 and was billed as having “actual sound recordings and interviews from the National Air Races in Reno.” I thought it was very clever creating a record that recorded Reno and was called Reno on Record. However, it was priced well beyond the impulse purchase range and deep into the “ask your wife first” range, so I decided to see if I could find it priced more economically somewhere else. I didn’t. But I did find CDs of Reno on Record 2 and Reno on Record 3. As ROR 3 was heaps cheaper, I bought a copy to check it out, not being sure why I did so. After all, who would want to sit around listening to airplane noises? The CD arrived promptly, but languished on my desk for weeks. Then the flight school sent both Rio and Lisa home with their pre-solo exams, an open book take home test, on the same weekend. Airplane noises in the background seemed just right for ambiance. And boy was it. As we sat around the kitchen table working through the Skyhawk’s POH, looking up FARs, pawing through the AIM, and scratching our heads over tricky weight and balance problems, race planes screamed around the track in the living room. It was inspiring. The perfect background noise for the task at hand. Of course, because we were studying, we had the volume down. Luckily, at the airport, we have no neighbors to alienate, but I appreciated the rebel sentiment. But living room or hangar, when you crank up the volume on this music you’ll smell the dust, oil, and avgas of Reno. This is one damn fun CD. If you like airplanes, I think you’ll be surprised by how much pleasure you can get from having them roar by in the background. Get a copy and see what it does for your soul on a foggy day, or how your flying friends react to it at your next hangar party. My rating: Five stars. No, wait. I think instead of stars, I’ll give it five Ercoupes. Last year, Lisa, Rio, and I went undercover. Twice. Well, once and a half, come to think of it. 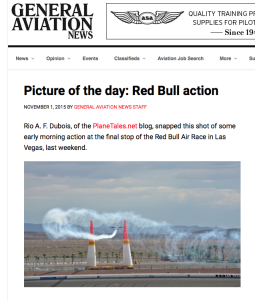 Here’s the Tale: As part of our General Aviation News series on air racing, we covered the National Air Races at Reno, and the grand finale of the Red Bull World Championship—which last year was held at the iconic Indianapolis Motor Speedway. At Reno we had legitimate press credentials, but we also joined the exclusive Checkered Flag Club as full members. So that was the one-half undercover. Why did we do that? Well, while Rio covered the race pits and Lisa shot the race action from out on the pylons and on the ramp, the focus for my pen was on the race experience of spectators—especially the value of clubs like Reno’s Checkered Flag. Hence our memberships. Then, for Red Bull, I decided to compare their Sky Lounge to Reno’s Checkered Flag Club. So the whole family went undercover with me to experience it, with none of us appling for press credentials. In hindsight, I probably should have written a single compare-and-contrast story, as the formula was somewhat the same and drew some negative feedback from readers, but going that route would have made for an article longer than any modern publication would run, what with reader attention spans getting shorter and shorter with each passing year. Anyway, this year, exclusive clubs being out of the budget with all the repairs to Race 53, we applied for proper press credentials for the Red Bull. 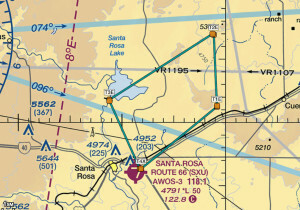 (We missed Reno altogether as AOPA’s Santa Fe regional fly-in was the same weekend. Really, who the heck schedules a fly-in the same weekend as the National Air Races???!) Anyway, Lisa and I were accepted by Red Bull, but poor Rio was rejected because he’s a teenager. 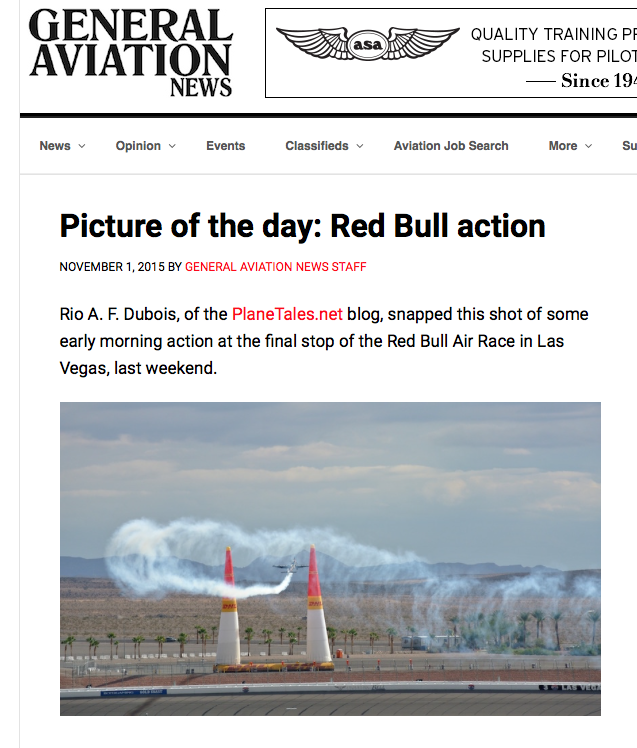 This was especially embittering to him as his first published photo was of a Red Bull Air Race. And we wonder why we can’t get teens interested in aviation… But that’s a story for another day. Still, Rio likes the Red Bull Air Races as a spectator as well, so he decided to come with us to watch from the stands while Lisa and I did the press thing. On the drive out, as we were—I kid you not—drinking Red Bulls, we wondered if the Red Bull folks would give free Red Bull drinks to the press. 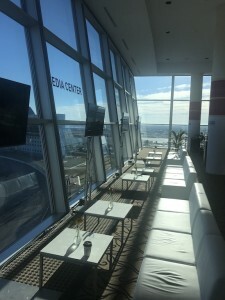 You see, as members of the Sky Lounge last year, we had full access to all-you-can-drink complimentary Red Bull. In fact, that’s what got us hooked on the stupid caffeinated energy drink in the first place. Prior to last year, none of us were Red Bull drinkers. 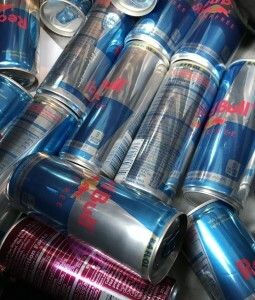 Now, Red Bull is only trumped by Red Wine in our diets, which come to think of it, also flowed freely at the Sky Lounge. But I digress. On one hand, it seemed like throwing Red Bulls at the press would be a smart thing to do. It couldn’t cost Red Bull much, and a happy press is more likely to give, well, good press, right? On the other hand, most outfits don’t do much for the media. Reno? They give the press water and granola bars. Well, when we got to Ft. Worth, not only did we discover that the 60-odd credentialed media got free all-we-could-drink Red Bull, but we also had an awesome perch above the Sky Lounge on the 9thfloor of the swanky Speedway Club, giving us a stunning view of the race course. The race planes zoomed into Gate 4 actually below us, then screamed up into their vertical turn maneuvers right beside the press centre. It may not have been all that great for the photographers (shooting though glass is a problem) but for writers like me it was awesome. Although, I think I was the only real writer there. Most of the media folks were shooters or video folks. Anyway, the press box also had catered breakfast, lunch, and afternoon snacks. If I had wanted to, I could have covered the entire event in absolute comfort. All I was missing was alcohol. Needless to say, a great view, free food, and a forecast for race day of temperatures in the 40s got Rio’s temperature up even more over the lack of press recognition. Meanwhile, the press passes Lisa and I had gave us access to most of the venue, including a brief time set aside for to interview the racers in the pits, and roof access for photographers above race control. 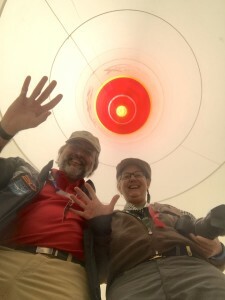 We also got a tour of race control and had the opportunity to go inside one of the inflatable pylons. You can check out our coverage in the next GA News, but back to the Red Bull part of this Red Bull story. We drank five sugar free Red Bulls coming out. That was all the dollar store had left in inventory. Looking at all those coolers and mini-fridges full of Red Bull, and selfishly thinking about my upcoming airplane repair bills, I told Lisa, “We should be sure to grab a few cans for the trip back home.” So every time I knew I was going to pass the car in the media parking lot on my various travels back and forth across the grounds over the next couple of day, I’d grab a few and toss them into the trunk. Lisa did the same. There were a lot of coats and what not in the trunk and I didn’t realize how many of the blue and silver cans were piling up until it got cold and I needed every jacket we brought. Oh my. Feeling a bit guilty, I asked our press contacts just how many cans of Red Bull that Red Bull gives away each race season, figuring I could justify our “sampling program” by being an infinitesimal drop in a larger ocean. The media folks didn’t know, but promised to get with the marketing folks, who got back with the media folks, who got back with us that this information is a trade secret. 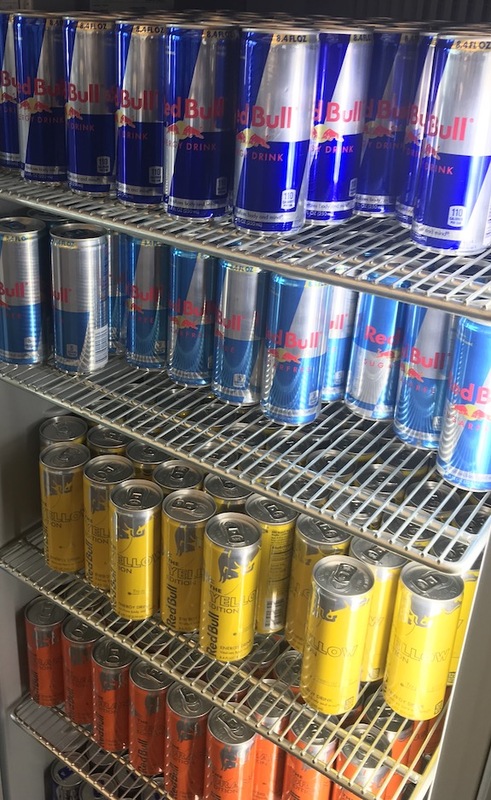 Well, there are no secrets here at Plane Tales, so if the marketing department is trying to figure out why five times more sugar-free Red Bulls were drunk by the press on a few cold days in Ft. Worth than at any other race in the series, we’re the guilty parties. But, I suspect it will work out for Red Bull in the long run. If we got hooked by a few freebies last year, can you imagine what this stash will do to us? I can see us now. Sitting on the street corner across from their Corporate HQ in Fuschl am See in Austria, sporting a hand-written sign on cardboard: Addicted and homeless. WILL WORK FOR RED BULL.